Updated with Midnight Opal info. The Nissan GT-R has piqued your interest, and now you are looking for a used example. Should you pick a 2009, 2010, 2011,2012,2013, 2014 , 2015? What are the differences? What is it that I hear about the transmission? Does it have launch control? What are some of the problem areas with the car? Which year is fastest? What is the NISMO? This guide is going to be based around US models first sold in July 2008. Worldwide models are similar but not exactly the same as US models. Stock the Nissan GT-R is fast, however with a strong aftermarket behind it, modified it is nearly unbelievable. 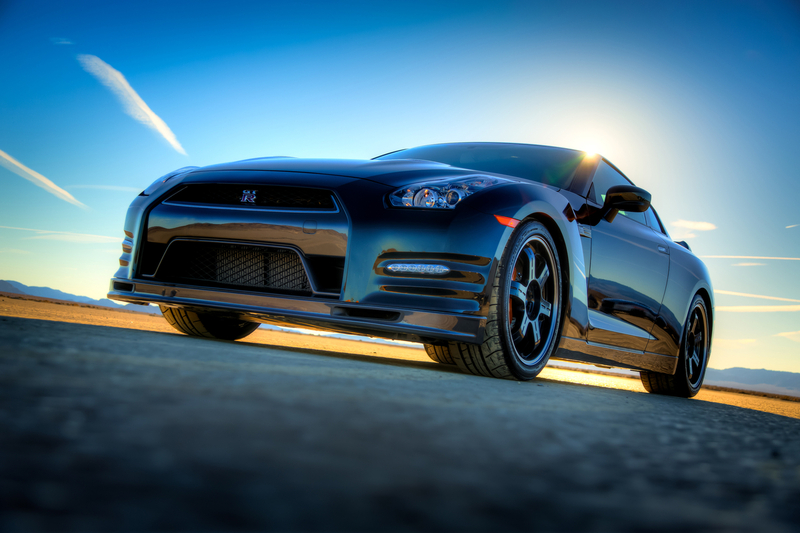 The Nissan GT-R or R35 was first sold in the US as a 2009 model starting in July 2008. Why is it called an R35? The chassis code for the 2009-2011(US) GT-R is CBA-R35. The 2012 up(US) GT-R has undergone several minor updates and is referred to as a DBA-R35. In Japan and other parts of the world, there has been a Nissan Skyline GT-R sold from 1969 to 1973, a 16 year break, and then from 1989 to 2002. From 1989-1994 the chassis code was BNR32, 1995-1998 was BCNR33, and 1999-2002 was BNR34. Even though the "Skyline" name is no longer used officially by Nissan, there are still many journalists and enthusiasts that refer to the R35 GT-R as a Skyline GT-R. In 2009, from July though December there were 667 cars sold in the US. In the first year of sales from July 2008 though June 2009 there were 2597 sales though the 691 certified GT-R dealers. July 2009- June 2010 there were 1171 cars. Total sales from July 2008 though October 2012 were 6489 cars. Breakdown by year, and some other countries is listed below. 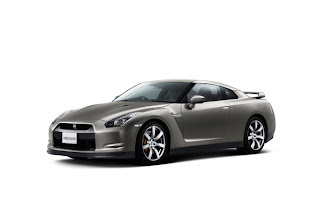 Two models of the GT-R were first offered in 2009 and 2010, the Base, and Premium, in 2011 the only model was the Premium,. 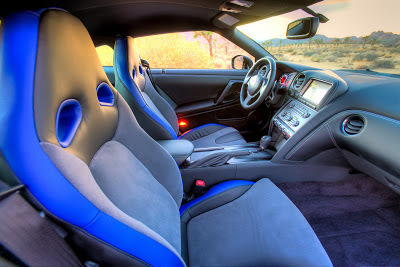 In 2009 and 2010, there were a few options available on each model, ipod connector($400) in the glovebox, GT-R labeled floor mats($280), and a cold weather package(NC). In 2011, the GT-R floor mats($280) and the cold weather package(NC) were options. Super Silver(KAB) paint was a $3000 option in each year. There were 3 runflat tire options, the Bridgestone(Premium), the Dunlop(Base), and the Dunlop all season(cold weather package).Six exterior colors were available in 2009. In 2010 and 2011 there were five exterior colors(Titanium was dropped). 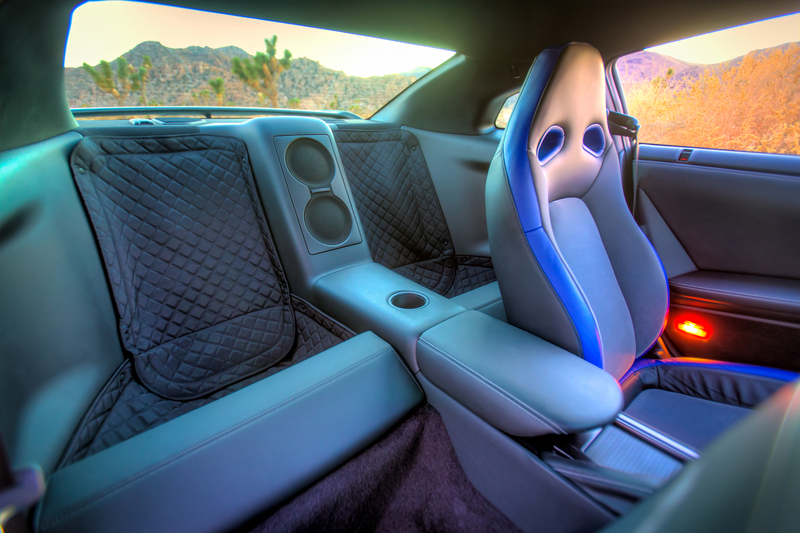 The interior had two color options, black and gray from 2009-2011. For 2012, there were a few changes to the color, and model options. A Premium and a Black Edition were available. The Black Edition sports unique wheels, red and black trimmed Recaro seats, and a black headliner. All performance aspects are the same for the Premium and the Black Edition, both now running a new version of the Dunlop Sport Maxx tires, or the Dunlop all season tire, the Bridgestone was dropped. For 2012 a backup camera became a $600 option for the first time officially in the US. The Black paint was changed to Jet Black(GAG), and Deep Blue Pearl was introduced (RAY). For 2013 Nissan GT-R the Nissan GT-R gets a world wide increase to 550PS (545hp). Torque has been increased to 463 lb-ft from 448 lb-ft. In addition, the suspension has been retuned and a handmade dry carbon rear spoiler has also been added to the Nissan GT-R Black Edition model. A RearView Monitor is now standard on all models. There is also a model called a Track Pack, that is built of a "other than the US" market Pure model. Information on the Track Edition was released in February 2013. Look for it to hit the streets in May 2013. 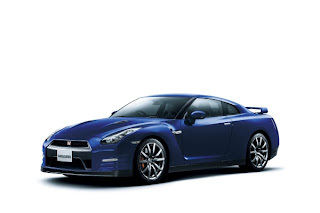 2014 US - 2013 Nissan GT-R Japan information. What we see on the Japanese 2013 Nissan GT-R, will probably show up on the US cars. However we only have a Premium GT-R, and a Black Edition. Some items will not find their way onto US cars as an option, like the carbon fiber Recaro seats. 0-62 (0-100 km/hr) time for the 2013 Japan drops to 2.7 seconds, with a 7:18.6 Nurburgring time. Just a second faster than the Corvette ZR1. 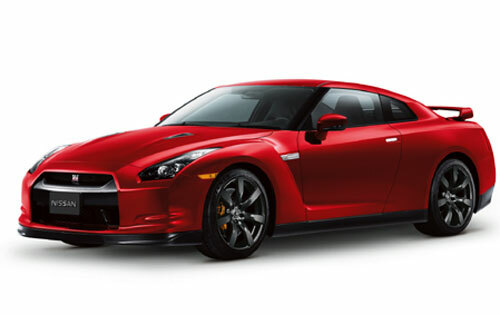 The US Market will get 150 Track Edition (Track Pack) GT-R's starting in May 2013. Nissan also offered a special edition Midnight Opal Nissan GT-R. Only 100 were offered worldwide. 50 in the US. The 50 for the US were all snapped up within two weeks. 48 went to Japan, and two were sold to Europe. 2015 US. 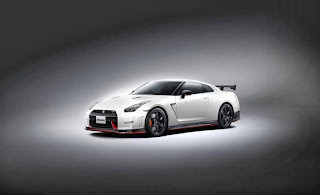 - For 2015, the big news is the NISMO version of the Nissan GT-R. Not a lot of information about the car has been released yet, but its 600 horsepower, lots of carbon fiber, new turbos from the GT3 car, new wheels and tires and a 7:08.67 Nurburgring time. With the harder NISMO version hitting the streets, Nissan has made moves to "soften" the Premium. An often critique of the R35 GT-R has been the harsh ride and noise. Bose active noise control has been added that is supposed to reduce interior noise by 10 dB. The spring rate and suspension tuning has been revised to improve ride. An additional color for the interior, ivory goes along with black, and amber red. An additional color Regal Red(NAS) is added for 2015. The MFD and instrument cluster see revisions. From all the current rumors, we are expecting the current R35 GT-R chassis to continue for several years. Nissan GT-R Premium: $84,060 USD Three options and one accessory are available for the 2011 GT-R: Cold Weather Package (no charge); special Super Silver paint ($3,000); Ultra-High Performance Tire Package (no charge); and carpeted GT-R logo floor mats ($280). 2012 Nissan GT-R has a new look, new colors, new wheel design and, most important to fans of pure power, 35 more horsepower under the hood. 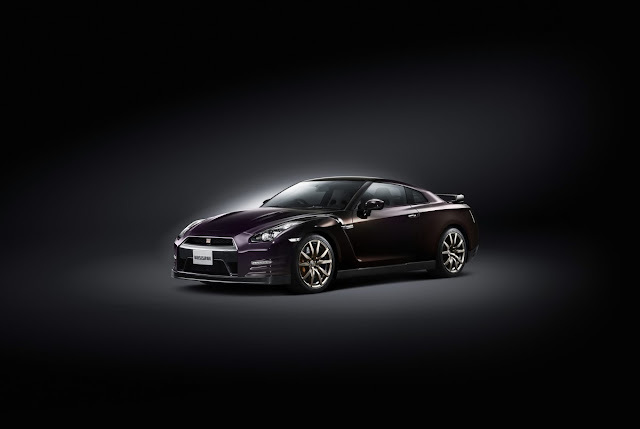 In addition, a new “Black Edition” – with unique seat design, interior colors and wheels – joins the GT-R Premium model. 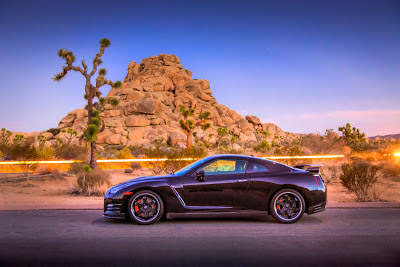 The starting MSRPs for the 2012 Nissan GT-R are $89,950 USD and $95,100 USD for the Premium and Black Edition respectively. The "standard" Premium GT-R comes in just under $100k, at $99,590. The Black Edition comes in at $109,300. Up a couple bucks versus last year. Super Silver is a $3000 option. The Amber Red Premium interior package is a $4000 option. Floor mats are a $285 option. Prices for the 150 Track Edition have not been released. (1) = Manufacturer's Suggested List Price: Dealer sets actual price. Prices and specs subject to change without notice. (1) Excludes tax, title, license, and destination charges. Destination and handling $1,595. 2009 Differences Base to Premium Premiums have the Bose 11 speaker stereo, heated seats, the Bridgestone tires, and darker colored wheels.Front seat and side curtain airbags were standard on the Premium. 480 horsepower for both models. Winter package cars all had silver finish wheels. 2010 Changes - 485 horsepower. Front-seat and side curtain airbags are now standard on both models. The 2010 GT-R also gets an enhanced suspension with redesigned shocks, new wheel finishes and new transmission control module programming "which optimizes clutch engagement for improved acceleration from a standing start with the vehicle dynamic control on,"
In addition, the braking system has been updated with more rigid brake lines for improved durability, and the brake calipers now carry both the Brembo and Nissan logos. Finally, the GT-R’s state-of-the-art suspension has been retuned with redesigned Bilstein shocks with a new valve body design and revised spring and damper rates. 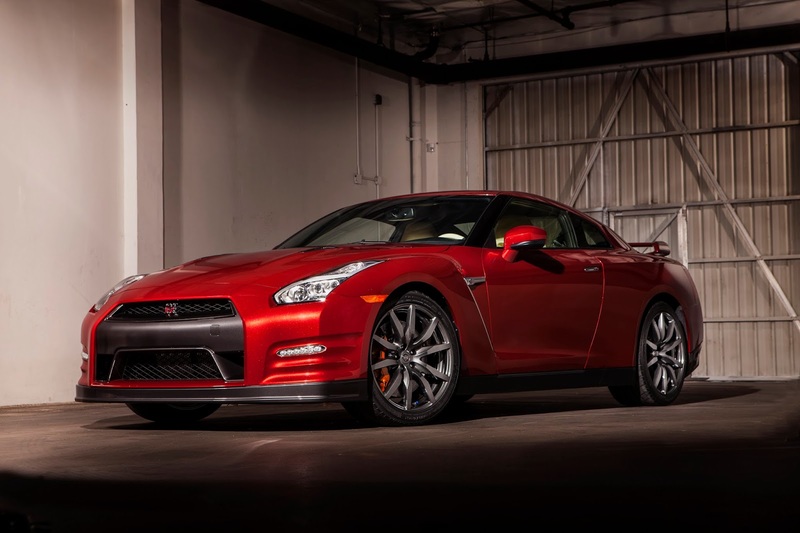 The base GT-R model is now equipped with slightly darker, high-luster, smoke finish for the 20-inch RAYS forged aluminum-alloy wheels, while a new “near-black” metallic wheel finish is standard on the Premium model. For 2010, one new color – Pearl White – is offered, while the Super Silver(KAB) exterior color has been enhanced to include a polished front bumper. Titanium(GAC) was dropped as a color option. 2011 Changes - Other changes include slightly darker wheel center caps, double clear coat on the front and rear fascias and the addition of rear cooling ducts to improve cooling performance around the rear floor area. The suspension has been retuned and the rear bushing strengthened to enhance ride comfort while still maintaining the GT-R’s outstanding handling. In addition, auto on/off headlights and speed-sensitive windshield wipers are now standard, along with a USB iPod® interface, Streaming Audio via Bluetooth® and DVD playback. The navigation system now includes XM NavTraffic® and NavWeather™ capability. Only a Premium model was available for 2011. Launch control was updated to what we call LC3. 2012 Changes. For 2012 the Nissan R35 GT-R has undergone what is called a "minor change". There are upgrades thoughout the car that give it more power(530hp), better handling, better braking, and improve overall refinement of the car. Check out the dealer "cheat sheet" with selling points on the 2012. 2013 Changes 2013 brings some additional horsepower for the next model year. +15 hp in the US to 545 hp, with a torque increase of 15 lb-ft to 463 lb-ft. There are some additional changes to the suspension, differential fluid, transmission, and some non confirmed engine internal changes. Rear view camera becomes standard. Blue lighting ring on the tachometer to match the shift position indicator. The US will see a Premium and Black Edition. The Black Edition adds a dry carbon fiber rear spoiler which should be the same as the wing on the now discontinued SpecV. For 2014 there are several minor changes to the Nissan GT-R, plus one extra interior option. Amber Red becomes an available option on the Premium Edition. For all the details on 2014 changes check out this link. 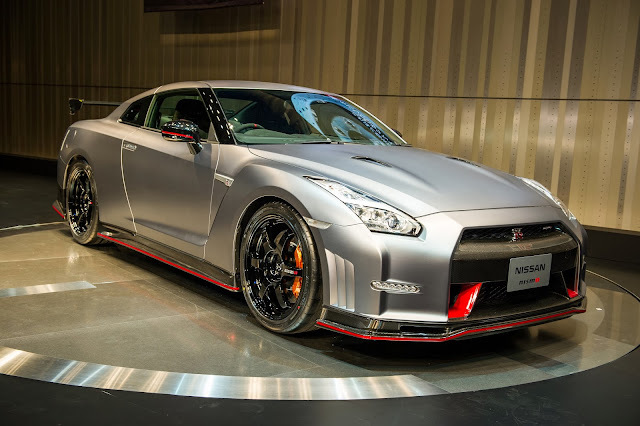 At the Chicago Auto Show, Nissan released some information on the 2014 Track Edition(Pack) Nissan GT-R's. Different suspension, new front seats/seat materials, no rear seats, front brake ducts and air guides. There will only be 150 cars offered hitting the streets in May 2013. Also in 2013 as a 2014 model, the Midnight Opal color/edition was offered at a $6,000 increase over the Premium Edition. 2015 Changes - Horsepower stays the same for the 2015, but the NISMO version gets 600 horsepower. On the exterior the GT-R's get new LED headlamps, and tailight revisions. On the interior, the Premium gets an additional color - ivory. The instrument cluster, and MFD get upgrades. On the Track Edition, the passenger side gets a seat heater, the rear seat is added back in, and a carbon fiber trunk gets installed. The Nissan GT-R is a world car, sold world wide in nearly the same configuration. This is an advantage to a low production run, expensive car like a GT-R. These are the most up to date figures we could find. Setup switches, clutch, suspension, and VDC. Launch control is enough of a controversy with the Nissan GT-R, that it is worth its own section. The first launch control on the GT-R was called LC1. LC1 would allow for 4500 rpm launches. VDC off, transmission up to temperature. Without VDC OFF launch control, the car would come off the line at 2000 rpms when torqued against the brake. The problem with the 4500 rpm launch, was wheel hop. 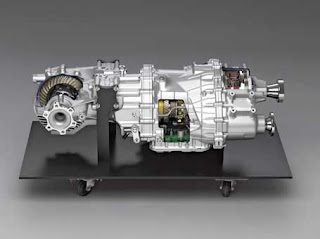 The GR6 transmission as used in the GT-R was the first production use of an longitudinal dual clutch transaxle. By September 2008, the first pictures of failed GR6 transmissions were floating around the web. The first failures seemed to be a catastrophic failure of first gear. For 2013, there may be a further improvement in the launch control. Nissan says that 0-60 mph has dropped to the 2.7 second range. From Nissan's own charts, it looks like there is not as much of a dip in RPM after launch. 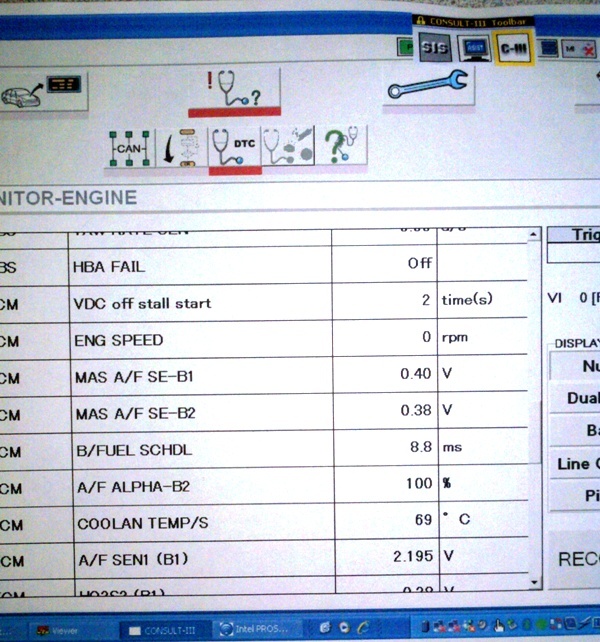 A Nissan dealer can use the Consult III to get a printout of VDC off(possible launches), and also transmission temperature logs. This leads to the next area of concern, the GR6 transmission. $20,000 to replace. $20,000 to replace. The sky is falling if your transmission in your GT-R fails. Yes, you will sound a little like chicken little if you listen to the dealer, and listen to people not "in the know" about the Nissan GT-R GR6 transmission. What I see as the main issue with the GR6 was that from Nissan, it was a non-serviceable part. What does that mean? It means that if you had a problem with it, Nissan's policy was to remove and replace vs trying to fix it. The aftermarket has stepped up with lots of replacement parts, plus methods of fixing common issues with the GR6 transmission. Transmission temperatures. This is another important point of the data available at the Nissan dealer though data they can collect though the Consult III , Consult III+ on the 2012 GT-R. Check out the section below for the oil change temperature intervals. Transmission coolers are a necessity for a car that is driven on a road course aggressively. Noises- the GR6 makes some noise. It is a high performance dual clutch transmission. You will hear a rattling sound at idle. There are some abnormal noises with some cars, but this is something for a Nissan dealer, or a shop familiar with the Nissan GT-R to check. Clutch alignment -The design of the clutch and transmission requires inspection and adjustment of the clutch and shift forks by a GT-R certified NISSAN dealer at the recommended intervals. Depending on driving conditions, more frequent adjustments may be necessary to help maximize vehicle performance. Or alternatively the Cobb AccessPORT with TCM support can do a clutch relearn and adjustment. Engine balancing - Each cylinder bank of this engine operates independently due to the vehicle's twin turbocharger design. 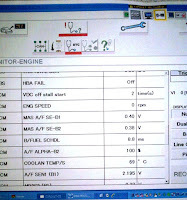 Each side of the engine must operate at the same level of performance. The air flow of each bank must be checked and adjusted as necessary by a GT-R certified NISSAN dealer. Checking wheel alignment-This vehicle is equipped with a high performance suspension. As the suspension components "break-in", the vehicle's wheel alignment needs to be measured and adjusted by a GT-R certified dealer at the recommended intervals. The first four Performance Optimization Services (POS) described in the Nissan GT-R Owners Manual are provided at no charge. Failure to have the required services done at the intervals noted may void any remaining Nissan warranty coverage. under "What Is Not Covered." See your Owner's Manual for additional important information and related warnings. There are a lot of questions about the warranty. There are questions about launch control and warranty. Nissan changed the warranty from 2009 to 2010, and there are some important differences. Here are a few links to information on the warranty. Nissan actually had two recommended alignments for the GT-R . The more aggressive track alignment will wear the tires more than the street alignment. This leads to the tire choices and life on the Nissan GT-R. 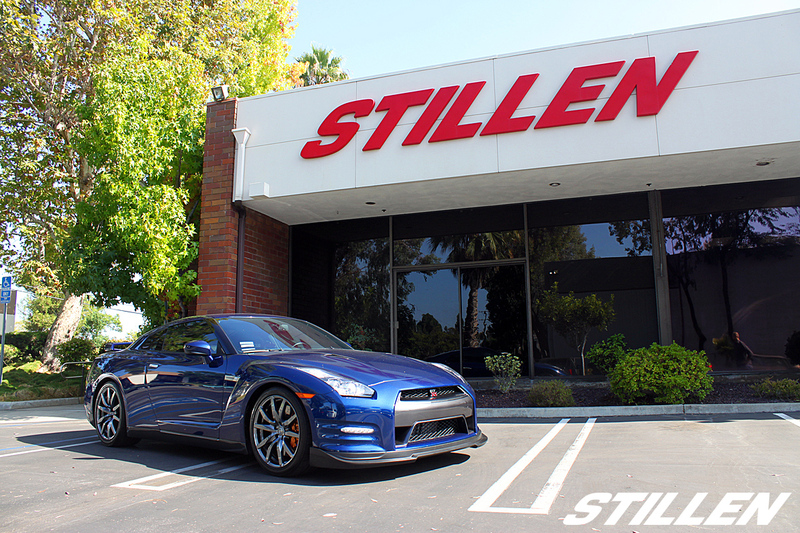 Prior to purchasing your GT-R, you will want to check the alignment, and set it according to your needs. The 2012 GT-R has different alignment settings than the 2009-2011 cars. When the Nissan GT-R originally ran the 7:38 Nurburgring time, in September 2007, Mizuno mentioned that the time was NOT on a cut slick tire. Somehow though the game of telephone, it was reported, or rumored that the Nissan was actually on a cut slick tire. This is not true. The OEM tires are a standard compound, lowest treadwear of 140, far from any kind of competition special tire. From the factory, there were three runflat tire choices filled with nitrogen. Front tires are a 255/40/20. Rear tires are a 285/35/20 The premium tire was the Bridgestone Potenza RE070, it is a treadwear 140 tire. The Bridgestone tires run about $1700 a set. The base tire was the Dunlop SP SPORT 600 DSST CTT, that is a treadwear 200 tire. The Dunlop 600's run about ($1780 a set). The Dunlop is the quick tire for the Nissan GT-R on the track. It will have a little more road noise than the Potenza, but on a track, it will be a few seconds a lap faster than the Potenza. 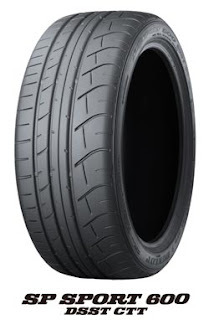 The last choice, which might be your first choice would be the all season Dunlop 7010 all season tires, treadwear 240. They cost about $1816 per set. The all season Dunlops come standard with the cold weather package. Overall tire height is important to a GT-R because of the all wheel drive system. If you change tires or wheels, pay attention to the heights. If you do not, you could damage the all wheel drive system, and have a non functioning ABS/VDC. According to the service manual no more than 12 mm of difference in height front to rear. Actual tire life depends on the tire, wheel alignment, and how the car is used. Some GT-R owners have mounted 285/35/20 tires to the front of their GT-R, on front wheels, and it works out well. For 2012, 2013, and 2014 Nissan has gone to a single tire the Dunlop Sport DSST 600 MAXX, and in the owners manuals they have relaxed some of the requirements related to the tires. Here are the sections. "When tire replacement is required, replacing tires as a set of four with new tires is recommended. However, if a tire is punctured or damaged, it may be possible to replace only the damaged tire. Determining whether one tire or a complete set of tires should be replaced is based on a number of factors including tire wear and condition. Contact your GT-R certified NISSAN dealer. They can recommend if an individual tire or a complete set should be replaced." "It is only possible to reuse the tires when they have no cracks and/or deformations on the bead portion of the tire." 6 piston front calipers. 4 piston rear calipers. 380mm x 34 mm front. 380 mm x 30 mm rear. Another controversial/expensive part of the Nissan GT-R. Here is why they are controversial. Nissan's official stance(2009-2010) is to replace the brake rotors, and brake pads, as a set. An entire set any time you need to replace them. 4 rotors, 4 sets of pads. Pricing it out, most guys come up with a brake change in the $7000 range. 2011: brake pads can be separately replaced only when a certified technician checks for scratches and cracks and judges that the brake disc rotors are reusable. Of course, since 2008 plenty of people have replaced the factory Brembo rotors that crack from the cross drilled holes, with new rotors, and differing pads than stock. 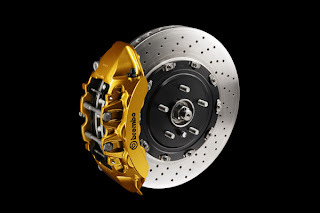 The brake rotors are a wear item, and are not likely to be covered under any warranty. The brakes are another item on the GT-R that makes some noise. A certain amount of noise is normal due to the high performance brake pads, and the floating rotors. 2012: The front brake rotors have been enlarged to 390mm, but are thinner at 32.8 mm, also the material, and the airflow though the rotor has been improved. The brake pads are the same shape for 2012 as the 2009-2011. There are 390 mm x 34 mm brake rotor upgrades available. 2013: The brakes remain unchanged from 2012. 390 mm front rotors, and 380 mm rear rotors. 2014: No changes to the brakes. For most used cars buyers, a stock car is more desirable than a modified car. Here is a fact related to car sales, modifications do not make the cars worth more money to most buyers. Generally buyers will not pay any extra money for modifications done to cars. Those $5000 21 inch wheels and tires, its not likely that you will find someone to accept the $5000 premium you are asking for, on top of the average selling price of the car. A GT-R is an easy car to modify the engines horsepower output. You will find a lot of cars that are modified, or WERE modified and now put back to stock. If you want a stock car, then it would be a good idea to get a mechanic to examine the car, to see if there are any signs of parts replacement. Exhausts and midpipe(Y-pipes) are popular and easy to replace. From the factory there are four catalytic converters. One in each down pipe from the turbochargers, two in the midpipe(Y-pipe). From the midpipe the exhaust goes back to twin mufflers and four exhaust tips. If you are looking to upgrade your Nissan GT-R, lots of companies offer one stop packages that pump the output up to 600,700,800,1200 horsepower or more. With a lot of aftermarket support, some of the fastest cars can even give the Underground Racing Twin Turbo Lamborghini's a run for their money. The stock Nissan GT-R exhaust note is fairly quiet. The 2012 exhaust is slightly different than the 2009-2011, but close enough to be called the same. Though the two turbos, four catalytic converters, a resonator, and twin mufflers, the tone of the 3799cc VR38DETT is muted to the point that many owners want some more sound. A good starting point, is to swap out the midpipe(Y-pipe). From the midpipe, next is usually a cat back exhaust swap. The next step in line would be the downpipes. The downpipes are a tough swap, because the studs holding the downpipes to the turbos often snap. If they snap, removing the broken stud requires lowering the engine. The Cobb AccessPORT for the Nissan GT-R has been the ECU tuning tool of choice for the Nissan GT-R community since it was released. There have been some other ECU's and companies that have shown up, but nothing has had the flexibility and the support of the Cobb AccessPORT. Installing a Cobb AccessPORT will generally void your powertrain warranty, although some owners have had transmissions replaced, even after an AccessPORT install. Nissan has the ability to see if the ECU has been reflashed. If you purchase a car that has a Cobb AccessPORT installed, make sure you get the actual hand held tuner, as per the picture on the right. If you purchase a used Cobb AccessPORT make sure it has been uninstalled from the car. If not you just purchased an expensive paperweight. The GT-R is a low, high performance vehicle. Did that make sense? . Low as in the front lip manages to catch on things like driveways, parking blocks and the like. The front lip from the Nissan dealer is a fairly expensive part, I have heard quotes for replacement $1200-$3000 from customers. The condition of the lip is something to look at prior to purchasing the car. There are some options to help cover up or minimize damage to your front lip. You can find out some more information about that here and here: The 2012 GT-R gets a new front lip. The 2013 Nissan GT-R lip is the same as the 2012. No one likes drilling holes into the front bumper of their brand new Nissan GT-R, but if your state requires a front plate, that was your only option. However now STILLEN has a tow hook license plate bracket that requires no drilling. Just remove the tow hook cover, and screw in the STILLEN license plate bracket. Nissan has made the owners manuals available for download as PDF documents. Here are some links to the pages. For 2012, there has been a few changes to the Nissan GT-R . They start being delivered in early 2011 as a 2012 model. Nissan GT-R (DBA-R35) information. 2013 model. Its unlikely for these to be dramatic as the 2012 was a substantial change from the 2011 car. 2013 brings some additional horsepower for the next model year. +15 hp in the US to 545 hp, with a torque increase of 15 lb-ft to 463 lb-ft. There are some additional changes to the suspension, differential fluid, transmission, and some non confirmed engine internal changes. Rear view camera becomes standard. Blue lighting ring on the tachometer to match the shift position indicator. The US will see a Premium and Black Edition. The Black Edition adds a dry carbon fiber rear spoiler which should be the same as the wing on the now discontinued SpecV. The 2014 car has been shown in Japan, and is expected to debut in the US at the LA Auto Show, going on sale in the US sometime in January. It has already gone 7:18 at the Nurburgring, but Nissan wants to try and beat the Dodge Viper ACR time. The 2014 Track Edition has been priced starting at $115,710. We are expecting to see a NISMO version of the Nissan GT-R soon. 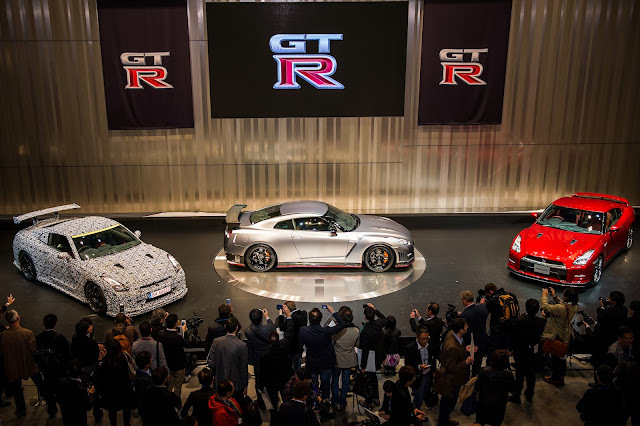 Just rumors so far, but they say it will be the "fastest GT-R yet." NISMO Nissan GT-R. Look for news the end of November. Is the 2015 or 2016 Nissan GT-R going to be a hybrid? The current rumors say that this chassis will continue until about 2018. Email me with any additional questions you have, or items I should add to this guide. NAGTROC (North American GT-R Owners Club). Looking for a NHTSA exempt, 25 year old Nissan Skyline GT-R? Click here. This is an EXCELLENT buyers guide and very good information and well reserched. Thanks a lot for all this time and information. Great info on the GT-R. Well done. Nice guide. It can really be helpful to follow this one. Thanks! This is the best aggregation of GT-R data on the web. Wow, amazing, in depth review and info on all aspects. Great job! Very informative especially on the tire part great write up! Now time to put back my stock tires. It's amazing. I receive all the information that I wanna know about this car. You've done an extraordinary job, dude! Thanks a lot for the info.....This is the most comprehensive I have ever found online. Over the years have all of the power increases been from software tweaks with timing and afr changes or have the turbos/exhaust/cams gotten slightly bigger? Have the engines internals stayed the same?